Carbonio’s latest carbon fiber intake for the 2.0 & 1.8 TSI engine is a truly race engineered ram air design that is available for the first time as an affordable street car intake system. 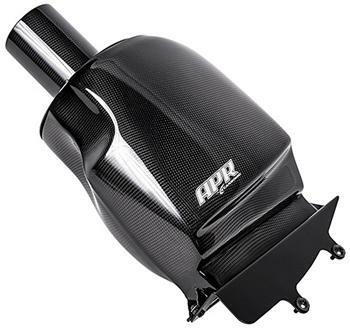 Building from years of experience on and off the race track, Carbonio’s and APR’s engineering teams have spent countless hours developing a true cold air and ram air carbon fiber design that can be recreated affordably for the street performance enthusiast. For many years professional motorsport organizations have suffered great expense to properly tune the air intake delivery system for transverse turbocharged engines for use in endurance and sprint races where every last horsepower and pound feet of torque can make the difference in position when crossing the finish line. Historically these designs have proven to be the most efficient and powerful although the most expensive to produce.